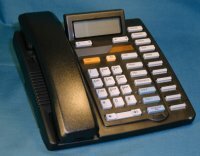 This two-line phone offers a professional design with added calling capabilities. Great for busy office settings, the #M9417 comes with a speakerphone and a caller ID capable display. (The caller ID display will not work without the caller ID feature on one or both lines.) The monthly cost of the phone includes the lease of two unique lines and phone equipment, touchtone service, distinctive ringing, and the built-in features listed below. *NOTE: Direct Inward Dial (DID) telephone numbers and the Call Transfer/ 3-Way Conference (3WC) feature are automatically installed when ordering this phone. Each DID number costs $1.25 per month and 3WC feature costs $0.50 per month. One-time order fees apply when ordering this phone. All prices are subject to change.